VIP Reception Doors: 1:30pm Meet and greet the artists with a glass of champagne! Love. 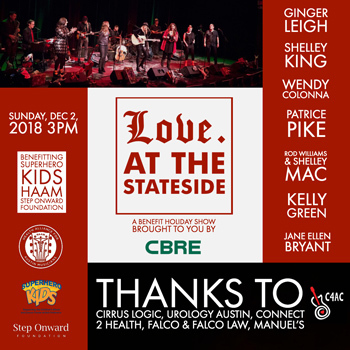 at the Stateside, on December 2, 2018, is an afternoon of powerful music benefitting the Health Alliance for Austin Musicians, Superhero Kids at the Dell Children's Blood and Cancer Center and Patrice Pike's Step Onward Foundation. Love. at the Stateside is co-produced by Ginger Leigh's Love. and Bill and Sharon Murray's C4AC. The show focuses on holiday and original music performed by one stellar band and 8 of Austin's top powerhouse vocalists, all lead singers, rotating on and off stage; Ginger Leigh, Shelley King, Patrice Pike, Wendy Colonna, Rod Williams and Shelley Mac, Jane Ellen Bryant and Kelly Green of the Texas KGB! Thanks to our sponsors: CBRE, Cirrus Logic, Urology Austin, Connect 2 Health, Falco & Falco Law, and Manuel's Restaurants. There will also be opportunities to make donations on-site directly to the organization.